Alan’s practice is focused on litigation and dispute resolution. He provides clients with the highest level of skill and integrity in all types of commercial and real property disputes. His primary goal is always to develop litigation strategies to maximize leverage in negotiated resolutions. However, when settlement proves unavailing, he has successfully tried cases involving sales and services contracts, construction law, tax assessment appeals, real estate titles, eminent domain, unfair trade practices, professional and business valuation and shareholder disputes. Alan has successfully litigated client’s cases in state and federal court at both trial and appellate levels. He has obtained million-dollar awards and settlements for his clients. His focus, however, remains on helping all members of the York community resolve their commercial and financial disputes with the highest quality services in the most cost-effective manner possible. A native of Detroit, Alan is happy to call York County home where he resides in Manchester Township with his wife, Alexandra, and their son. 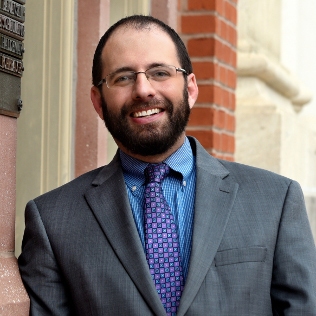 Alan is a 2018 graduate of the Leader York, Leadership Training Program, and is a member of the boards of Child Care Consultants, Inc. and the Publication Board of the York County Bar Association. He is also the author of several published treatises and essays on philosophy and legal theory.